Food riots and violent looting are becoming part of everyday life for many Venezuelans, as the South American country is gripped by an economic crisis that is threatening the socialist government of President Nicolas Maduro. Venezuelans are spending hours waiting in line for basic supplies such as flour and rice, which often run out before they can buy them. Meanwhile, supermarkets across the country have become a focal point for anger, with riots a daily occurrence. There are now more than 10 lootings every day in the country, according to the Venezuelan Observatory of Violence. And more than a quarter of the 641 protests in May were over food, a figure that has risen every month this year. The food crisis is the latest manifestation of a collapsing economy that is heaping misery on Venezuela's 31 million residents, who are increasingly unhappy with the way things are going. And the situation is stepping up pressure on President Maduro, with growing anti-government sentiment boosting the opposition’s efforts to pursue a recall referendum to oust him. Venezuela may have the world’s largest proven oil reserves , but plunging crude prices have helped push the economy over the precipice. The country is languishing close to the bottom of many important economic indicators, faring worse than Greece, Ukraine or Argentina in Bloomberg’s Misery Index. It is also one of the world’s least competitive countries, placed 132 out of the 140 economies assessed in this year’s Global Competitiveness Report . The World Economic Forum came last for labour market efficiency and its institutions. Inflation is predicted to increase to a crippling 720% this year, according to IMF estimates. As the chart below shows, the value of Venezuela’s currency, the bolivar, is plummeting. Runaway inflation means prices for goods will continue to soar, making even basic provisions such as food, medical supplies and toilet paper unaffordable. In addition to its economic woes, Venezuela is one of the most violent countries in the world. 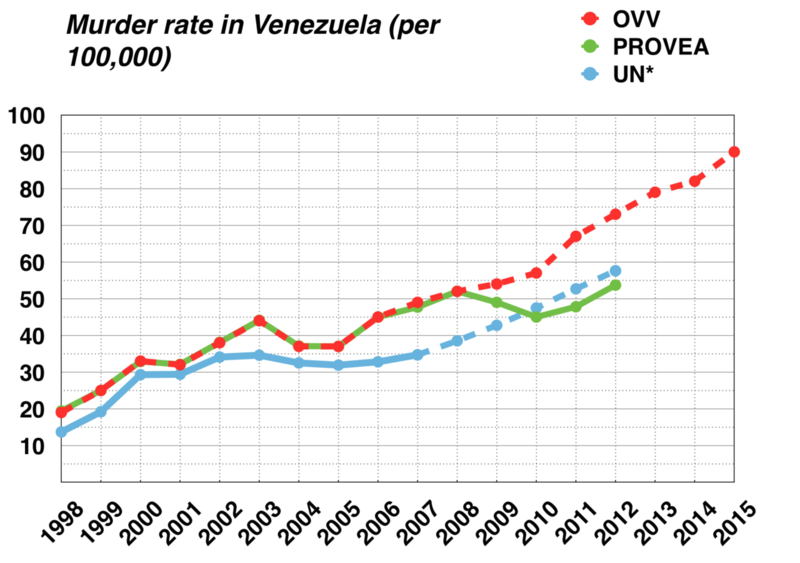 According to a report by the Venezuelan Observatory on Violence, the 2015 homicide rate was a shocking 90 per 100,000 residents – more than 10 times the global average .